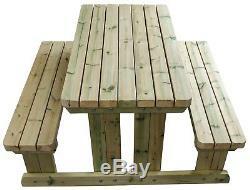 Premium Heavy Duty Walk In Picnic Table Made With Chunky Furniture Grade Swedish Redwood. Pressure Treated to Resist Weather for 15 Years. DELUXE PICNIC TABLE made with 95mm x 45mm superior Redwood imported from Sweden. This wood is furniture grade and much higher quality than found in other picnic tables who use cheaper CLS and Whitewood. Wood is sanded to a smooth, comfortable touch. LOOKS GOOD FOR 15 YEARS when sitting outdoors in harsh weather. We use premium pressure treatment Tanalith E.
Redwood takes pressure treatment much better than other woods. Your table looks great for decades without splintering, rotting, or degradation. You'll notice all the nuts are recessed into the wood to prevent snagging and injury. We also carefully sand all edges with the belt sander to soften them. Our timber is planed to a furniture grade (not a construction grade) This feels much nicer to the touch. Great for sharing lunch with family and friends on summer days! EXTREMELY STRONG & STURDY DESIGN thanks to the extra chunky timber we use and the strength of the build design. This table is suitable for both commercial and residential use. 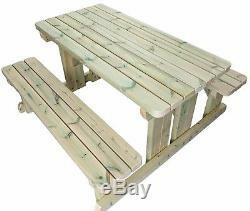 Our picnic tables are used by many schools, pubs, and garden centers. EASY ASSEMBLY IN JUST MINUTES. We provide simple assembly instructions with your order and also a video demonstration that shows you the assembly process in real time start to finish. All screws and fixings are supplied. This makes a great gift for anyone who enjoys a premium picnic table with superior design and first quality timber. Great for friends & family. 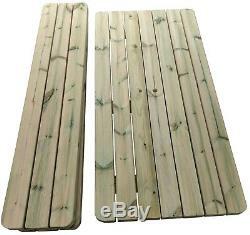 SUPERB QUALITY WALK IN PICNIC TABLE. Made of premium imported Swedish Redwood. We bring this direct from a FSC member sawmill in Sweden where we select the species of tree and even the best suited section of that tree to use. All timber comes from a well managed responsible forest and is a renewable resource. This picnic table is extra strong using 10m x 90mm coach bolts that are recessed into the wood for extra strength and safety. Only Weather resistant coated screws are used on our products and You'll notice the wood is big chunky furniture grade 45mm x 95mm pressure treated redwood. Makes this picnic table last and last. You can put it outdoors and leave it for years and it will still look great with a nice feel to the touch. So you can expect a full 15 years of protection from the elements, insects, and pollutants. Includes using furniture grade wood with a tighter, denser grain. This gives you a better look, more strength, and longer lasting wood. We plane it to a very smooth finish and use a belt sander on the edges to remove splinters and soften. It feels so much nicer sitting at this table. You'll love the great looking natural features of the wood. Our picnic tables do not come from faceless factories. We are a small shop of woodworkers who take great pride in our products. Our prices may not be the lowest, but our work will always amaze you. WE AIM TO POST IN JUST 1-2 DAYS! WE CAN ALSO DELIVER AND ASSEMBLE PLEASE MESSAGE ME FOR DETAILS. FULL INSTRUCTIONS PROVIDED WITH FIXINGS, EASILY PUT TOGETHER WE RECOMMEND 2 PEOPLE AS THE PARTS ARE FAIRLY HEAVY. ALSO AVAILABLE IN 4ft, 6FT + 8FT PLEASE CONTACT FOR DETAILS. 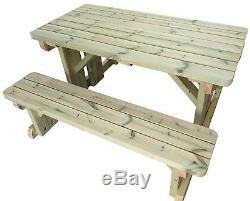 The item "5 FT Heavy Duty Walk In Style Picnic Table / Pub Bench / Very Strong & Sturdy" is in sale since Wednesday, July 26, 2017. This item is in the category "Garden & Patio\Garden & Patio Furniture\Garden Chairs, Swings & Benches". 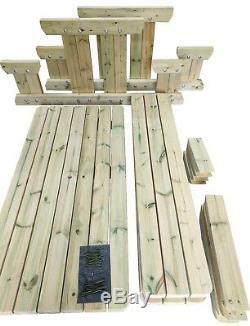 The seller is "mgtimberproductsltd" and is located in Wolverhampton.